The packed ringside at Skipton’s annual hoggs’ highlight. 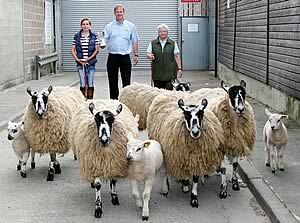 Selling is David Wood with his geld gimmer hoggs class winners. Some 1,500 breeding sheep, among them almost 500 individual pairings of sheep with lambs at foot, plus 285 geld hoggs, came forward for the annual hoggs’ highlight. Together with a strong turnout of prime sheep, in total just short of 4,000 sheep were penned for sale at the bustling bank holiday fixture. The packed ringside again included a strong contingent of buyers from Cheshire and other Midlands counties seeking to supplement their flocks, with selling prices of £200 for hoggs with single lambs regularly achieved, while geld hoggs averaged a heady £127 each. Across-the-board averages were well up on the corresponding fixture last year, with Mule hoggs and singles up £42 per outfit. As in 2010, local vendor John Stapleton, of High Skibeden Farm, Skipton, dominated both the prize awards and prices in the Continental hoggs and lambs class. His first prize pen of five Texel-cross sheep with five Beltex lambs headed both the class and show prices at £280 when selling to Cheshire buyer D J Jackson, of Northwich, the third year in succession he has purchased the first prize winners from the same exhibitor. Mr Stapleton also presented the third prize pen, sold at £230 to Warwick Gill, Melton Mowbray. In total, he sold six pens at £200-plus. Hannah Brown, left, with her parents’ Skipton Mule hoggs and lambs class victors, joined by Richard Paul, of Farmway, and judge Margaret Watkinson. The first prize pen of Mule hoggs and single lambs, again a 5+5 combination, was shown by Martin and Val Brown, of Beechwood House Farm, Newton-le-Willows, Bedale. They made £270 per outfit, top price in class, when joining M & B Allen, Saltburn. The Browns also sold a total of six pens at £200 or more. 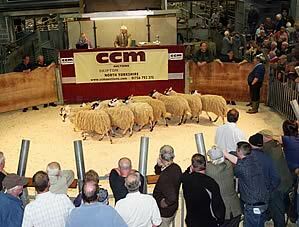 As in 2010, the geld gimmer hoggs class fell to a pen of ten Mules from David Wood, of Wilcocks Farm, Rivington, Chorley, who also acts as a part-time auctioneer at Skipton Auction Mart. The first prize winners also headed the class prices when knocked down at £150 per head to Ronnie Airey, Trawden. Show classes were judged by Margaret Watkinson, Sessay, and main show sponsors were animal feeds firm Farmway and livestock identification company Allflex, represented by local agents Richard Paul and Jane Chapman respectively.